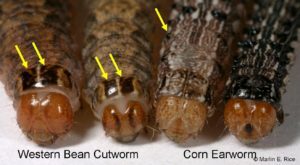 Recent scouting efforts and grower calls indicate that corn earworm (CEW) are present in Ontario corn fields this fall, some at pretty high levels (Figure 1). Late planted fields are the most at risk, as CEW moths typically don’t blow in from the US until later in the summer and prefer to lay their eggs directly on the fresh silks. Compared to previous years, western bean cutworm (WBC) infestations were reasonably low this year. This was in part due to much of the corn crop being planted early and fewer fields being in the ideal crop stage (pre-tassel to full tassel) when moths were abundant. Though there are some exceptions, where despite eggs being nearly absence during those critical crop stages, some larvae are now present in ears in some fields. I am concerned that growers and scouts who have found damage this fall might be assuming it is from WBC when in fact it is from CEW. Or worse, they have not been looking in their fields this fall at all, assuming that WBC levels were low or that they sprayed for WBC and don’t realize that CEW may have come in after the fact and is causing damage and increasing ear mould incidence. Scouting is advised so that you can assess what levels are present, and more importantly, if there is an increased incidence of ear moulds that require harvesting that field sooner than later. 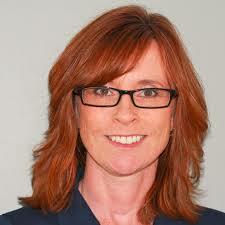 How do you tell the difference between WBC and CEW? Both pests can go completely unnoticed, as the larvae can enter via the silk channels at the tip of the ear. 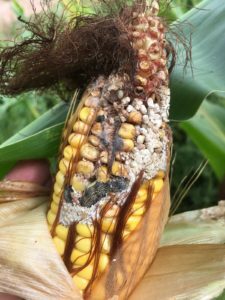 Their damage is very similar, though only WBC will occasionally leave a hole on the side of the husk as they exit or enter a new cob. You really need to see the larvae to tell the difference. Colour can’t be a reliable indicator as both can be brownish/beige. CEW vary in colour; some larvae can be green, some yellow and others brown but all have stripes running along their body. Usually WBC loses its stripes once it is in the last instar stages of larvae. If you see yellow or green larvae, then it is CEW since WBC can only be brown/beige colour range. If they are brownish-beige, then you need to look at their heads too. CEW heads are usually a light brown with a network of veins running across its face. They lack the two broad bands behind their heads that WBC have (Figure 3). A key feature of CEW are spines or hairs that are coming out of the warts along the side of their body. WBC do not have warts, spots or hairs along their body. 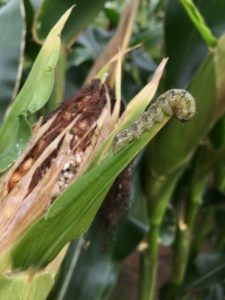 We haven’t been trapping for corn earworm in Ontario as it is typically a sporadic pest. But longer, warmer falls and frequent strong storm fronts might start to bring this pest in from the southern US on a more regular basis. And concerns about their potential resistance development to Bt corn and cotton in the US will be our concern too, given the source of the population come from those regions.